Erith Contractors, NFDC and IDE make massive charitable donation. 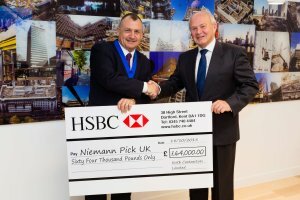 Erith Contractor’s managing director and outgoing Institute of Demolition Engineers’ president David Darsey has handed over a pair of massive cheques to David Roberts of the Niemann-Pick UK charity last week. The Niemann-Pick UK charity works closely with families and individuals living with Niemann-Pick and helps them manage this life-limiting disease. The Niemann-Pick diseases are a group of rare lysosomal storage disorders that can affect both children and adults. David Darsey has been personally affected by Niemann-Pick for the past two years following the birth of his granddaughter, Nancy, in November 2016. Shortly after Nancy’s birth, the Darsey family received the devastating news that she had been diagnosed with Niemann-Pick Type C. Darsey has since gone to great lengths to raise money for NPUK and increase awareness of this rare and heart-breaking disease. In June 2018, Darsey hosted a fundraiser for NPUK, Nancy’s Night Out, in homage to his granddaughter. The event was a huge success, raising significant funds through ticket sales, auctions and generous donations which will be used to provide care and support to families in need. David Roberts, Trustee at NPUK, visited Erith’s London office where David Darsey presented him with two cheques. The first was on behalf of Erith Contractors Limited for the sum of £64,000.00 raised at Nancy’s Night Out. The second was on behalf of the IDE who generously contributed and additional £5,000.00 to this worthy cause from their auction and raffle at the AGM last November.